Truck racks are often considered a very important part of a truck. However, trucks generally come without one installed, leaving the owner to leave it rack-less or go buy and install one. What if you decide to get a rack for your truck, how do you know which one to buy? It’s could be confusing for you as a consumer, considering that there are literally hundreds to choose from. Worry no more, as we are going to talk about everything you need to know about how to choose the best truck racks in this post. Not only that, we have rounded up six of the best ones on the market right now, as well as a description of their best features, pros, and cons. We do recommend that you evaluate this information very carefully to be able to come up with an informed buying decision. While your truck allows you to haul plenty of materials and equipment, some of your cargo might just be too big to fit. You would now want to drive around with a ladder just dangling around, right? This is where the importance of getting a rack for your truck comes into play. Truck racks serve as an additional equipment for your pickup truck, permitting you to transport lengthier and heavier loads with you. Another benefit these racks can provide you with is that it can virtually double your cargo capacity. With a truck rack, you will be able to keep several items at the back while you mount additional items overhead. Choosing heavy-duty truck racks made from tough materials is highly recommended, for it to be able to support hundreds of pounds for hauling. With this useful equipment on your truck, you can transport more gear in one drive, as well as do it safely. Your pickup truck already delivers an incredible performance in terms of carrying your cargo. But when you pair it with the best pickup truck bed cargo racks, you would be taking the next step towards its ultimate utilization. In this section, let’s talk about the different types of truck racks to know which one is suitably engineered for your hauling requirements. Your pickup truck’s bed is perfect for transporting your gas cans, toolboxes, and coolers. However, even the longest pickup truck would not be able to take on extra-long and large loads. Over-bed truck racks provide you with an easy solution by adding almost 1000 lbs of weight capacity above the bed of your truck. These are commonly built with lightweight but tough materials, giving you a sturdy space for your heavier load. Over-cab racks have the capability to transform your pickup truck into a double-decker while offering you an appropriate amount of space for hauling just in one trip. These are generally made of lightweight but sturdy materials, allowing you to maximize every space of your rig’s roof while still leaving you enough space in the truck bed. Outfitting your pickup truck with side-mount racks would allow you to make transporting long gear a very easy and convenient job. In fact, it can fit even a full-sized ladder, lumber, pipes, as well as carpet rolls. Overall, this type of rack allows you to upgrade your pickup truck’s hauling capacity without taking away any space from your truck’s bed. As with the previous truck racks, side-mount racks are constructed with sturdy and lightweight materials. Most of the products reviewed in the following section offer versatility and compatibility with pickup trucks, no matter the bed size. With this, you should mind the dimensions, as well as the height and length of the items you wish to haul. If you are undecided if a model would be able to fit your requirements, you might want to consider a truck rack that allows more maneuverability in terms of adjustment. The carrying capacity is another very important consideration when choosing a quality truck rack. While this may be subjective, it should all depend on your needs and requirements. If you are certain that you will never have to haul heavier loads, then you can settle for a truck rack with a minimum carrying capacity. Some truck racks require you to drill them, which would mean that it is not at all advisable to remove or reinstall them. Other racks, on the other hand, come with a clamp system, allowing you to mount and unmount them very easily. While bolted truck racks offer a lot more stability than clamp-style truck racks, they do provide little to no reuse. In addition, it requires you to have a drill, as well as the knowledge on how to use one. However, if you don’t want this kind of hassle on your part, buying easier to install truck racks might not be such a bad idea. The Apex ATR aluminum truck rack is extremely lightweight, with its four upright posts you can install on compatible long or short truck beds. It features adjustable crossbars, allowing you perfect weight distribution. In addition, it can accommodate up to 800 lbs of load weight. Installing it will never require you to drill, thanks to its secured clamp system. With its design, the Apex ATR truck rack is suitable for use by shop-owners and contractors, even those who transport pipes and lumber, among others. Another noteworthy quality of this truck rack is its perfectly-made aluminum frame. To add, getting is has been proven to be cost-effective, aside from being sturdy and lightweight. Just like any other product, getting this truck rack also has a downside, which involves its instruction manual. Either it is outdated or written incorrectly, the hardware that comes with the package does not correspond to the ones in the instructions manual. Another thing is that it does not come with tools that will allow you to install it conveniently on your truck. Instead, you need to buy all the necessary equipment just to be able to install this one correctly. The TracRac truck roof rack features an 800-lbs capacity if the weight is evenly distributed and installed properly. 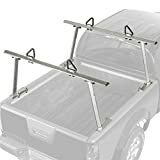 In fact, it is a one size rack that fits all trucks, perfect for hauling long and heavy items that will not fit the bed of your truck. It is made of rust-resistant aluminum that also comes with a dual-stage powder coating that resists wear while matching the finish quality of the truck. Another great feature of this truck rack is that it comes with an easy-to-remove clamp, allowing you damage-free installation. Every package of the TracRac truck rack comes with the front and rear aluminum racks, eight single axis mounting clamps, as well as four adjustable crossbar loop tie-downs. Lastly, it is compatible with kayak accessories but does not come with locks. The MaxxHaul aluminum truck rack’s vertical and horizontal posts are crafted from durable rust-resistant aluminum material. Its base brackets, on the other hand, are made of heavy-duty steel that delivers maximum strength and style, thanks to its powder coat finish. It features an internal reinforced structure on the crossbar, which effectively increases the rack’s strength, with a maximum weight capacity of up to 400 lbs. Another great feature of the MaxxHaul aluminum truck rack is that its crossbar has the capability to extend up to 70 inches long that will be able to fit in most truck beds. In addition, its height was measured at 26 inches, effectively supporting upright cargos. Every purchase of this MaxxHaul product includes an adjustable cargo bumpers found at the end of each crossbar, which prevents your cargo from sliding, especially during stop and go transition. Lastly, it can easily be mounted onto your pickup truck. A downside, however, is that this specific truck rack cannot be installed on pickup beds that has railings with bed liners and cleats. The TMS adjustable truck rack comes in a set of 2 heavy-duty steel truck ladder rack. It is a multi-functional truck rack designed to haul longer and bigger items that cannot fit into an average pickup truck. Overall, it is great to use for hauling ladders, pool equipment, as well as pipes, among others. It comes with a very sturdy frame that can carry up to 800 lbs of weight. It is also very easy to install and its width is highly adjustable from 5 feet up to 7 feet, catering to various truck bed sizes. With these qualities, attaching longer and bigger items securely to this rack is possible, as it is very convenient while it ensures your property’s safety. Its maximum height is up to 30 inches, not including the height of your truck bed. The width, on the other hand, is adjustable from where the rack is attached up to the track bed. Indeed, these features alone make it one of the best pickup truck bed racks right now. Can accommodate a weight of up to 800 lbs. The truck rack created by Smittybilt has been specifically engineered to meet and exceed high standards in the industry. In fact, the brand assures that it is of high quality and dependability. In addition, it has been tested to last under extreme conditions. It features tie-downs found at every corner and it also comes with a wind deflector, which effectively eliminates cab noise. It has a heavy-duty design, removable rear crossbar, gusseted corners, and it is very easy to install. Lastly, we have the AA-Racks removable ladder rack for trucks, which features a universal design that fits a wide range of full-size pickup trucks. It is very durable, as it comes with a reinforced heavy-duty aluminum construction, making it perfect for hauling lumber, ladders, pipe. Its maximum weight capacity was measured at 800 lbs and it is a no-drill ladder rack. Lastly, it is equipped with universal mounting clamps, making it one of the best roof racks for trucks with caps. Choosing the best truck rack would now be a lot easier, thanks to the review and buying guide we have provided for you. All you need to remember is to evaluate the features, pros, and cons, as well as the factors that need to be considered when choosing a good truck rack, to be able to come up with an intelligent buying decision.